O-man! We missed our flight to Oman. Oops, it left at 2pm not 6pm. Not the best start to the next leg of our trip. So a detour to Heathrow, and then red-eye on to Muscat. The flight was empty and filled with travellers (not business people). Coming through the gates, 100 men waiting in collarless floor length gowns, and a few ladies in black abayas (with only the face showing). The kids don’t bat an eye (just me wishing I had sunglasses so I can gawk). We’re off to the hotel. Cleaned and white washed is the only way to describe the city. The hotel is filled with Europeans, and their pastey offspring. Modern. The Sultanate of Oman is located at the South-eastern end of the Arab Peninsula, Population 2.9 million (750 thousand of which are ex-pats). Omani’s are 100% Islamic. Having never been to, or near the middle east, I was woefully ignorant of what it’s like to be in an Islamic country. At fist, it was a shock to see the majority of people dressed in the traditional black clothes (Abayas for woman) and white (dishdashas for men), but before long we realize that behind the veils are smiles. The people are welcoming and happy to talk (but not about politics or religion). Oman feels like the safest and cleanest places we have ever been. There’s no litter or garbage, and everyone looks freshly scrubbed from the barber. It’s not what I expected. New, clean, and friendly? No war on terror here? Prim and proper. Everyone seems to have immense respect for their country and themselves. That being said, Oman is no apres ski party and is “dry” except in the large hotels. We feel very relaxed. As in any Muslim country we attempt to dress properly (with legs and shoulders covered). It’s an easy way to avoid offending any locals and feeling comfortable, as opposed to being ‘half naked” as one taxi driver described the tourists. 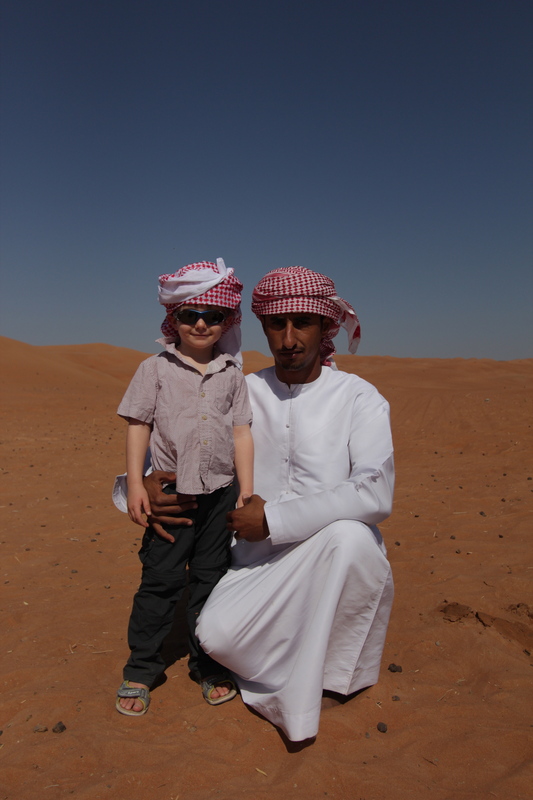 We have decided to travel to the desert and experience life as a Bedouin camel herder. The kids are curious about what the dessert is like. ‘When are we going to see the sand and Cactus’?’-sorry no cactus’ Before we reach the sand, we stop at a gas station and Abdullah gets the tire pressure down to 18psi, for better traction in the sand. Ash helping Abdulla drive. 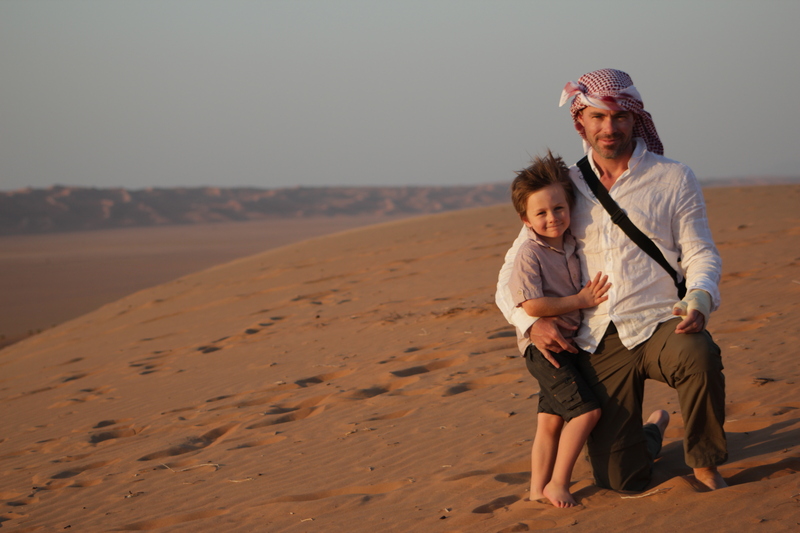 When I double checked the safety concerns about Oman, the biggest danger is….wait for it….. driving!!! A road side lunch with delisious lemon chicken, and tomato onion salad. A peaceful little wadi (water valley) in the rocks. Ten jeeps with blaring arabic music come out of nowhere. They all wear head and face scarves to protect themselves from dust. 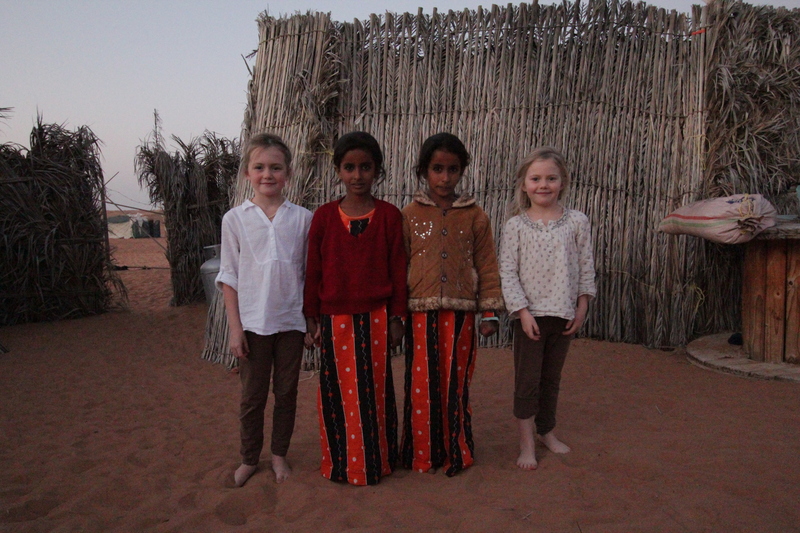 We arrive at night, and stop first at a house on the outer edge of the dessert. The house/compound is made of palm fronds and the floor and the world surrounding us is sand. The kids are ecstatic and immediately remove their shoes. The children of the house (twin girls and a boy), and their mother, sit across from us and serve us rich cardomom coffee and dates. The coffee is delicious and the dates have bits of spice mixed in (cumin seeds?). Gwen breaks the tension by asking to see the girls’ room. This is unorthodox, but children are persuasive, and the gaggle run off to look and at what is a thatch hut somewhere in the darkness. 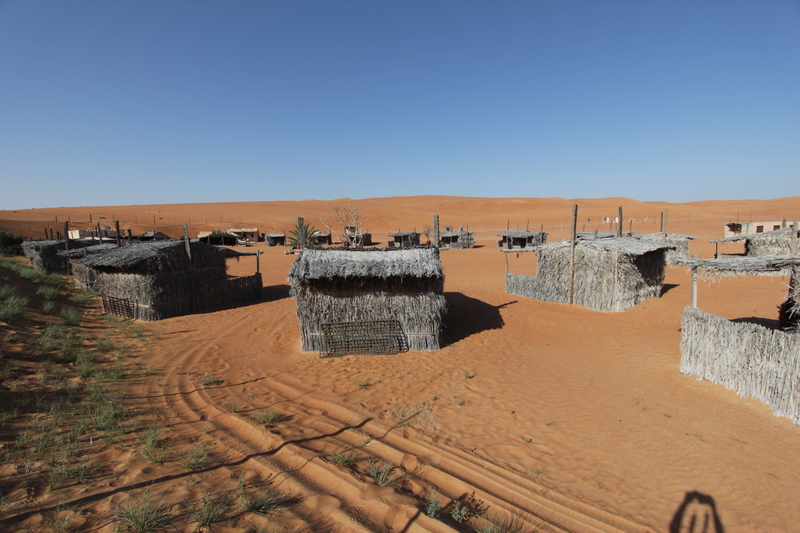 Next stop, the Nomadic Desert Camp, s nestled in the dunes out of the wind, and is surrounded by a wire fence to keep out the grazing camels. 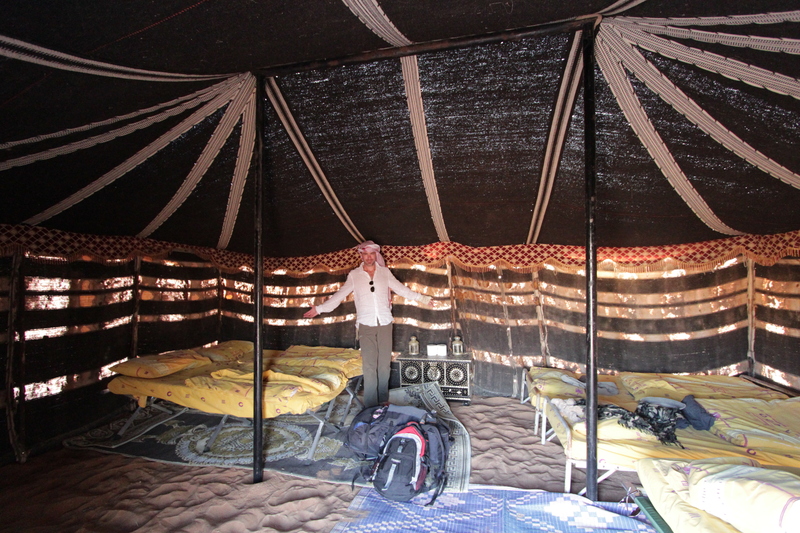 The huts that we sleep in are basic but comfortable, with carpets on the walls and floor to insulate against the wind. 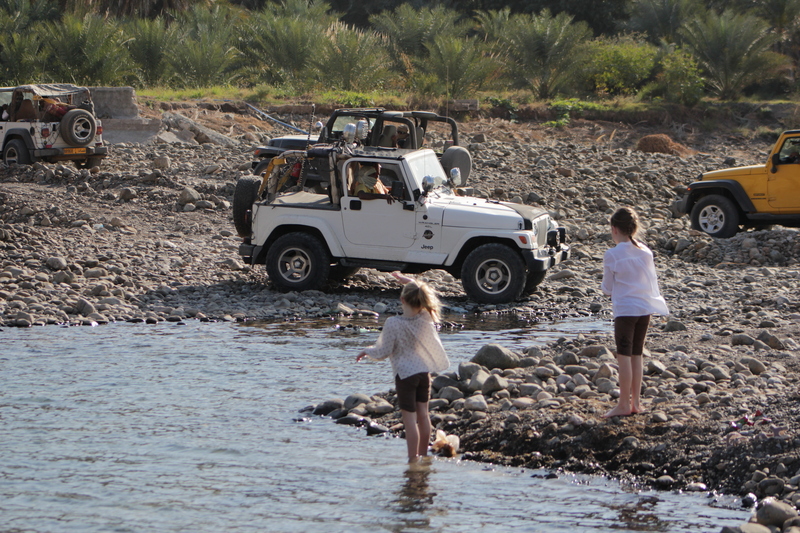 The kids love running around in the sand, happy to be out of the car, after hours of driving through wadi’s (valleys with water) and desert. 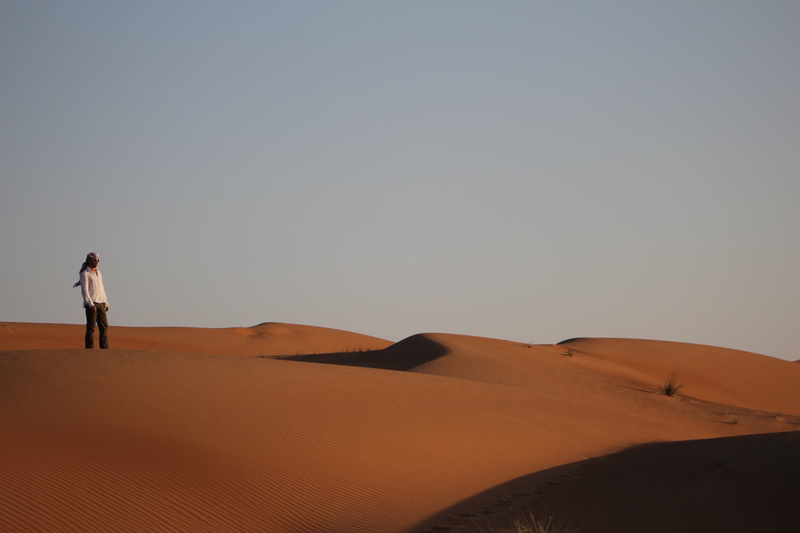 The silence is heavy in the desert, deafened by the velvety orange sand that is everywhere. 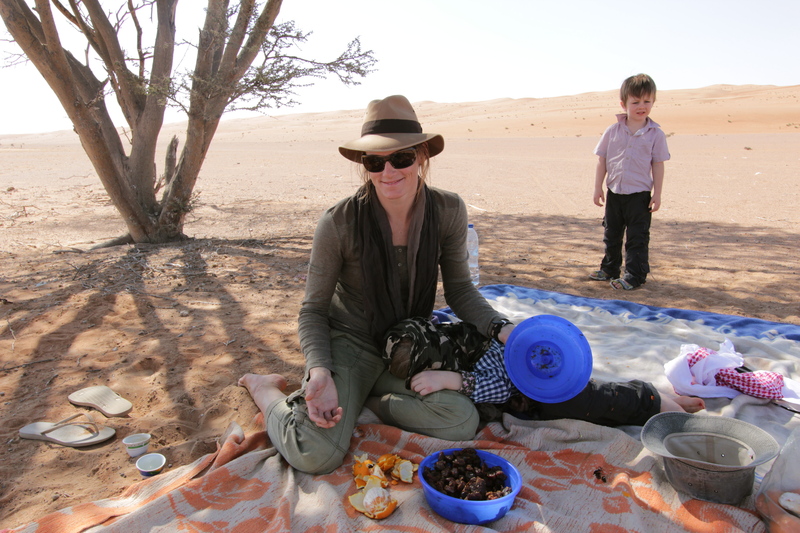 After a night ‘in camp,’ we are going on a camel safari which will involve a camel ride to our tent out in the dunes. 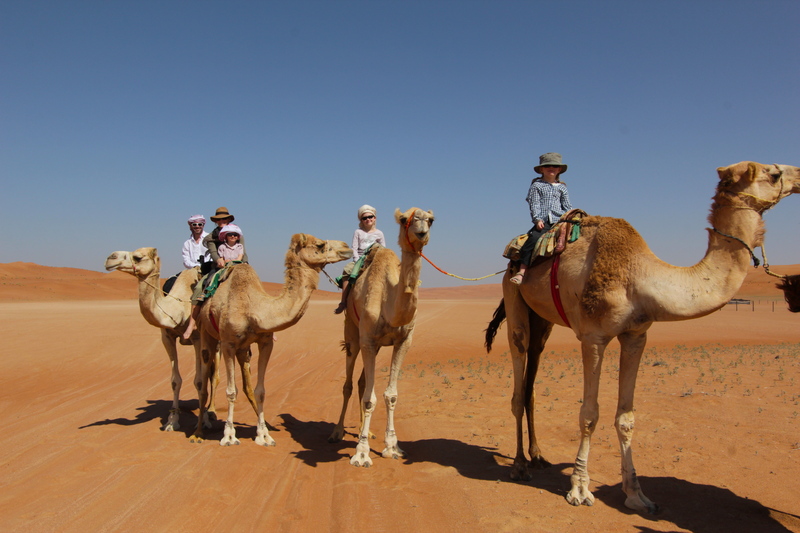 It’s 10am before we finally mount our camels and start our walk across 4 km of sandy dunes. 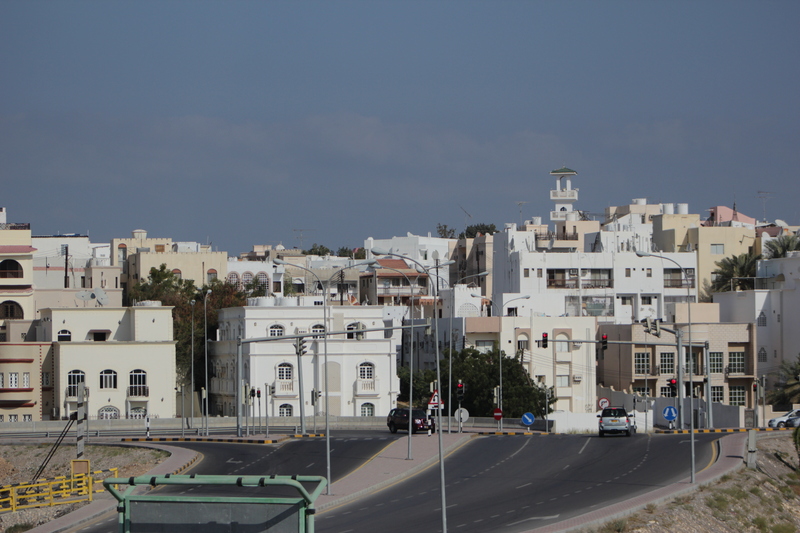 The sun is hot, but it’s winter here in Oman, and the temperature high will reach only 32C (a staggering, 55C in the summer). The night is a different story, the temperature plumets to a chilly 8C. How could we have sent home all our toques?…We only had 9 bags full of warm clothes! It can rain as little as once a year. The last rain was in november. There is still some residual green left from that rain. The camp is run by a family of five brothers, each with a job that keeps the camp running. No women work in the camp. They are a pious bunch, and we all feel well looked after and safe. The biggest danger out here is the potential of a scorpion bite (apparently rare…I hope) which are sometimes attracted to the light of the fire. A few mosquitos at night, but the least vicious we’ve encountered anywhere. 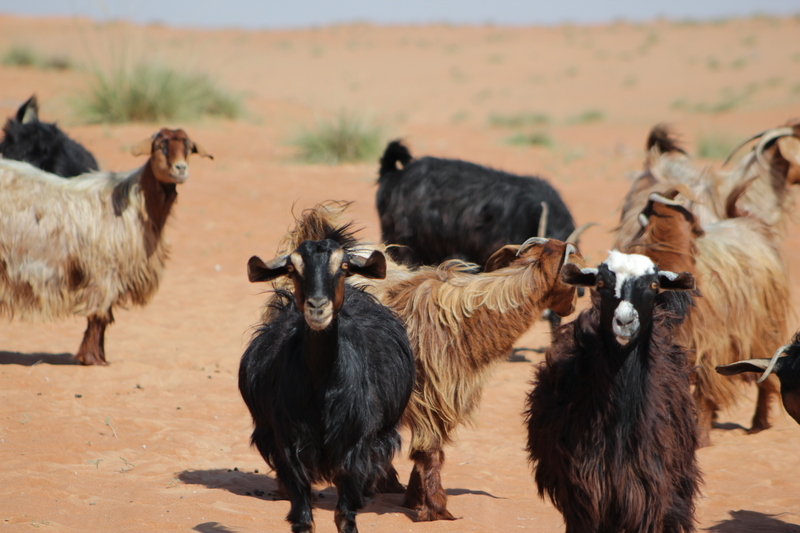 The other animals that are found in the desert are rabbits (sand-coloured), black foxes, mice, birds (they look a bit like whiskey jacks), and goats. lots of goats. The brothers have taken to re-nameing the children, and call them Arium (gwen) and Reem (kate)…which means gazelle and two gazelles, and Saleem (Ash). Ash has started answering to it. The camels are summoned to sit by a series of guttural throat clearing sounds, and we climb aboard, their limbs fold and disappear under their giant bodies. 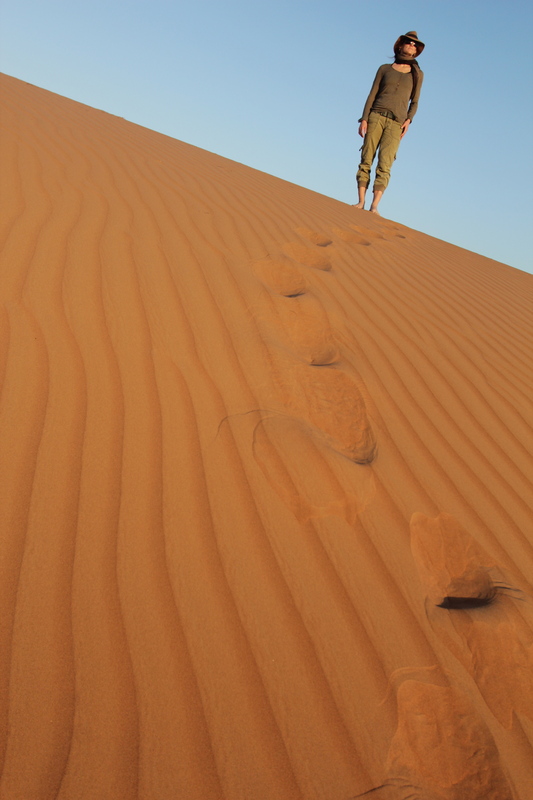 Sultan pulls the camels, walking barefoot over the sand, thorn, and bits of rocks with no notice. Sometimes he rides, and will use his cane to direct his lead camel. 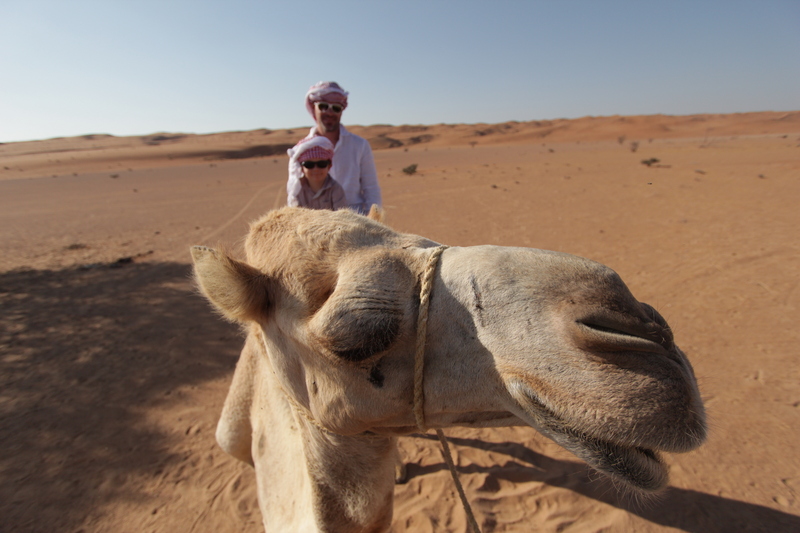 Before coming to the desert, I had heard that 1)camels spit, 2)camels are stinky. 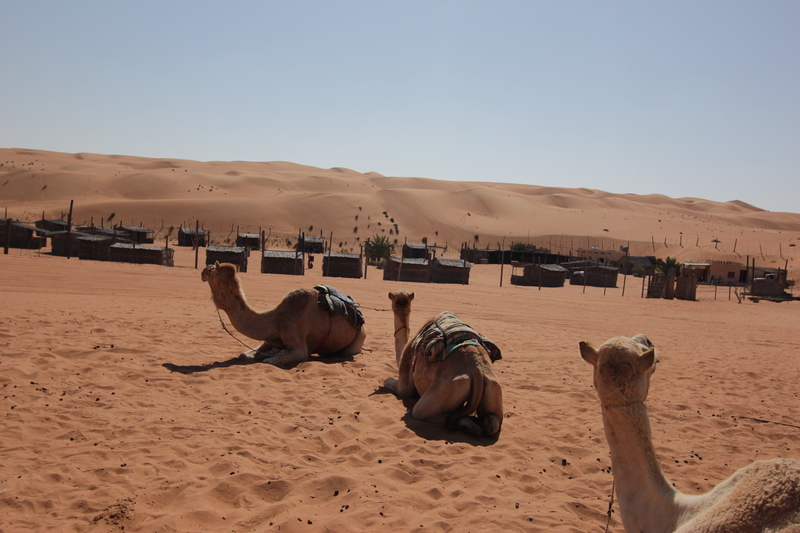 It turns out, that camels spit only if they have been over-fed and are sick. 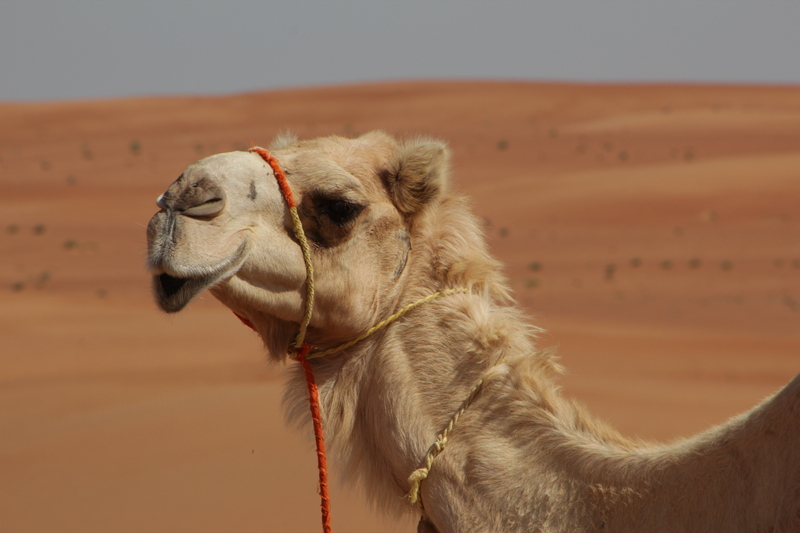 These camels are soft, nibbling at your palm, their lips curling into a smile to show off their eight teeth. They are the colour of …camel. The heat is dry and very tolerable. It’s much better to be covered up then to bare our lilly white skin to the extremely strong sun. A long lunch in the cool of one of the few trees. 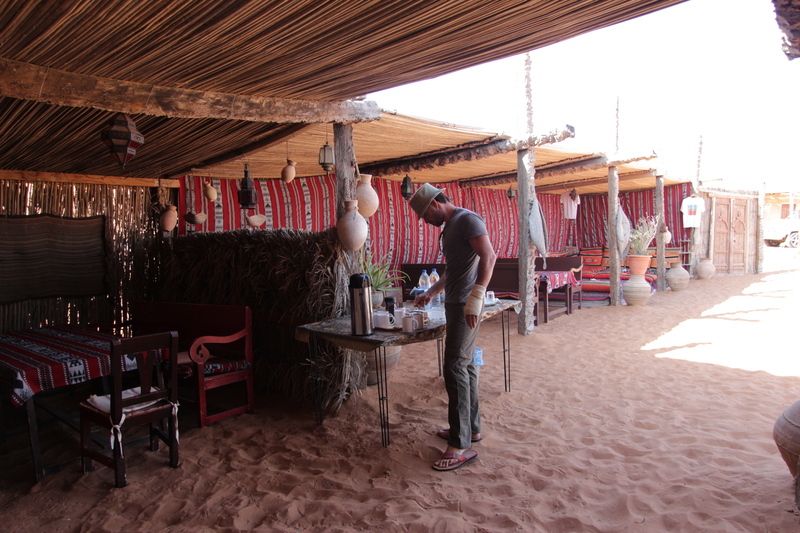 No break is complete without coffee and dates. The desert is at it’s most beautiful in the evening, with the setting sun giving everything a surreal red glow. Our ‘family tent’ for our camp out. 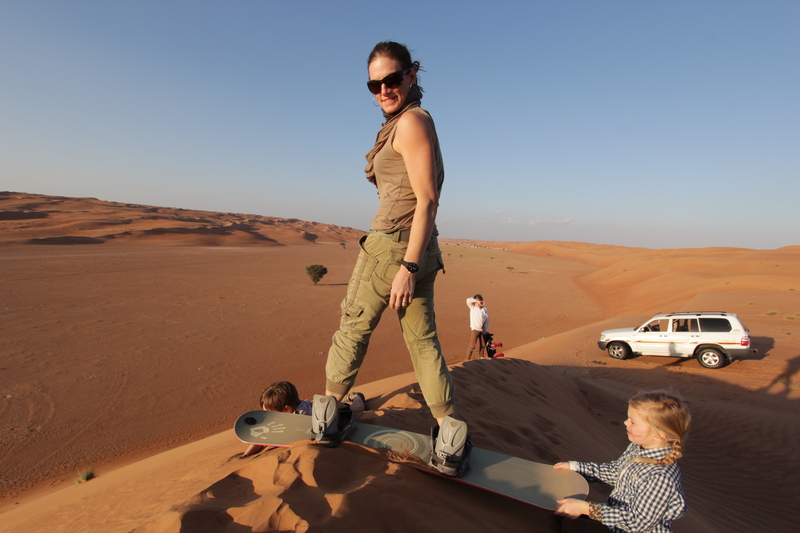 we all (except don with his broken hand) try sand-boarding. 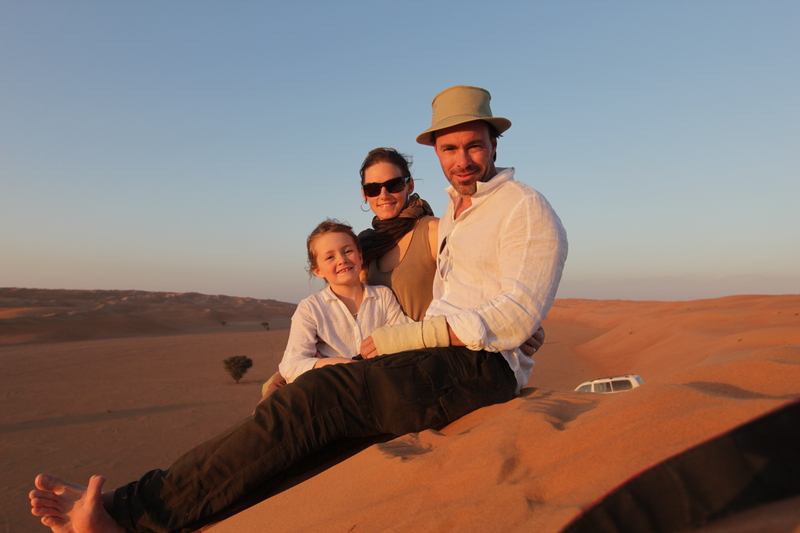 It’s a thrill to ride the dunes… and I thought walking up snow was hard!!! 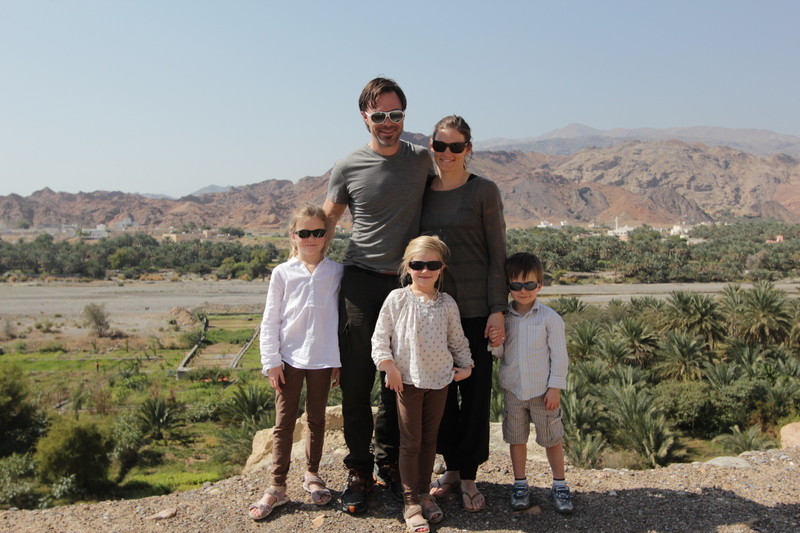 Oman was a surprisingly easy country to travel in. Clean and lovely. A gem in the arab penninsula. As always we are left wanting more. Aparently the surfing is awesome, and the snorkling sublime. Next time. We are headed to Zanzibar next. It has the reputation of being a mixture of India, Arab (from Oman), Persian, European and African. I’m going to put a word in for you at National Geographic! Pics and story are amazing! The glow on your skin from the sand is beautiful. Arnprior has snow and freezing rain which has called for two snow days during Thomas’s exam week. You are an excellent writer. This particular blog is a treat to read while it is grey and cold here in North Van! Jess, I just have to tell you how much I am enjoying your fabulous tales and pictures. This is truly the adventure extrordinaire! You are a wonderful writer and really do capture the essence of each place – so vividly!!! I am excited with each new blog – can’t wait to hear about Zanzibar and your African Safaris.